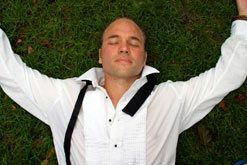 Edward Vilga shares the Transformative Power of Wellness in New York City @Exhale and throughout the world. Here he leads a yoga class for the first Summer Solstice Celebration in Times Square, simulcast on the jumbotron. He has taught interactive workshops across the country for corporations ranging from AOL to NBC-TV. His most recent online class RICH WITH PURPOSE on DailyOM has over 24,000 students enrolled. Edward Vilga has had eight wellness books published. His most recent is THE YOGA OF MONEY MANIFESTO (Stone Heap Publishing; April 2017), a guide to applying mindfulness practices y to one’s financial life. THE YOGA OF MONEY MANIFESTO hit #1 on Amazon for all of New Thought. Edward Vilga has created various bestselling wellness products designed to share health and mindfulness with the mass audience. He wrote and directed YOGA IN BED which hit #1 for all of wellness on Amazon.com after he appeared on LIVE WITH KELLY, and was featured in PEOPLE and 40 other magazines. YOGA IN BED has been translated into more than a dozen languages. The DVD has been downloaded and viewed over 1 million times.